First of all, the company has to know which customers it will serve. It must segment the market based on certain criteria that are relevant to the company. Then, it has to select one or several market segments to serve. We call these two steps segmentation and targeting. Finally, the company decides how it is going to serve the selected customers. This involves differentiating itself from other offerings in the market (differentiation) and aiming at a position in the market and in customers’ minds (positioning). In order to do so, the company must identify the total market, then divide it into smaller segments. Next, select the most promising ones and then focus on how to serve and satisfy the customers in the selected segments. The company should never neglect the crucial importance of centring the marketing strategy around the customers’ needs by delivering superior value. Only then, it can survive in today’s competitive marketplace. But before we can satisfy customers, we first have to understand their needs and wants. Therefore, the process of establishing a marketing strategy requires thorough and careful customer analysis. 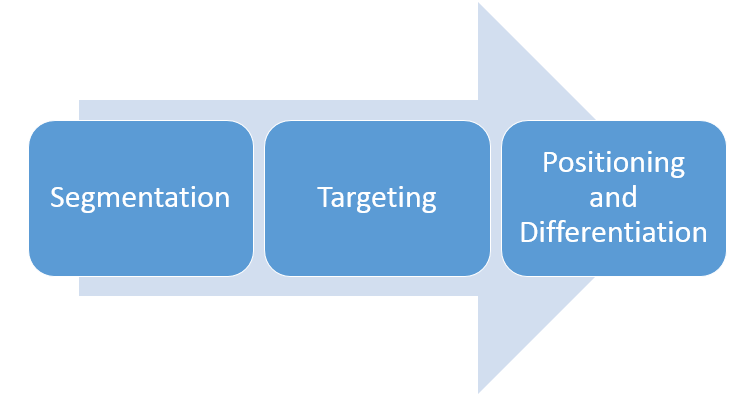 Segmentation, Targeting, Positioning and Differentiation – necessary for an integrated Marketing Strategy. Any company should know that it cannot serve all consumers in the total market – at least not profitably and in the same way. The variety of different kinds of consumers and their needs is simply too large. There are too many differing types of customers, characteristics, needs, wants, and behaviours. Also, most companies can serve some segments better than others, because there is a greater fit between the company’s strengths and the segments’ opportunities. Thus, every company should not try to focus on the complete market. Instead, it should divide it up into small segments. This is the first step of setting up a marketing strategy. The market can be seen as a huge pie. But the company has only one mouth. So, it should choose the part of the pie which appears most delicious for the company. In other words, the marketer must determine which of all the segments offer the best opportunities. We can define market segmentation as the process of dividing a market into distinct groups of customers who have different characteristics, needs and behaviours and therefore require different products or marketing programmes. Consequently, we can look at a market segment as a group of consumers responding in a similar way to a set of marketing efforts. Therefore, we have to group consumers, based on various variables which are relevant to the company. These variables can be based on geographic, demographic, psychographic and behavioural factors. But not every variable is equally useful for each company. For instance, a car manufacturer would gain little by distinguishing between vegetarians and non-vegetarians. However, for a meat company, this may be the most important variable in the marketing strategy. An example for segmentation can easily be recognized in nearly every market. Let’s take a look at the automotive industry. You will find small, economical cars for those who care mainly about price and operating economy. But on the other side there are big, sportive cars with large engines for those who want the best performing cars regardless of price. It would not be wise for the car manufacturer to try to create one offering for both segments. The resulting marketing strategy would never result in satisfying results. Instead, the company should focus on meeting the distinct needs of each individual market segment it wants to serve. Learn more about market segmentation. After having distinguished between the separate segments in a market, the company can select one or more of these segments to enter. Before doing this blindly, each segment should be assessed. Therefore, targeting is concerned with evaluating each segment’s attractiveness for the company and selecting one or more segments to enter. The evaluation of segments is based on the question which segment the company can serve best. In other words, we should concentrate on and enter those segments in which we can generate the greatest customer value over time. Whether a company decides to enter one or more segments may also depend on its resources. If these are limited, it may be better served to focus on one or a few smaller segments, which we call market niches. In the best case, the company should look for segments competitors overlook or ignore. Alternatively, a company can decide to enter several segments. This may be based on a strong relation between the segment in terms of resembling needs, or on the company’s widespread resources. For instance, clothing companies often target more than only one segment: males, females, children and so on. A large company such as a major car manufacturer might even decide to serve all market segments by offering a complete range of products. However, the usual case is that a company first enters a new market by serving one single segment. Later, if that proves successful, it may add more segments to serve. Learn more about market targeting. Now that we know which segments there are in the market and having chosen one or more to serve, we have to decide on the how. How will the company differentiate its offerings for each targeted segment and what position does it aim at in those segments? That are the last steps in setting up the marketing strategy. Differentiation and Positioning are strongly related and depend on each other. Positioning, which is the process of arranging for a product to occupy a clear, distinctive and desirable place relative to competing products in the minds of target customers, depends on the differentiation. Because through the differentiation, which is the process of actually differentiating the product to create superior customer value, we can achieve the desired position in customers’ minds. Firstly, we need a plan on what position we want to achieve with our product in the minds of our target customers. The position is the first thing a customer would think of hearing the name of the product or the brand. This position should be chosen so that it is distinguished from competing products to the greatest extent possible and lead to the greatest advantage in the target market. Therefore, the company should first identify possible customer value differences which provide competitive advantages on that the position can be built on. Should the customer think of our product as the cheapest one, or the best one, or the nicest one? Or should the customer think it is the most sustainable and environmentally beneficial one? This must be determined before establishing the marketing strategy. But only promising those values is not sufficient. If the company promises greater customer value to achieve a certain position in customers’ minds, it needs to deliver that value. The marketing strategy means nothing without the means to carry it out. Therefore, positioning depends on differentiation, by which we actually differ our product from competing ones so that it gives consumers more value. After the company has chosen a desired position, it can take the steps necessary to deliver and communicate that position to target customers by differentiation. If the desired position is to be seen as the cheapest product in the market, the product should be differentiated by an exceptionally low price. If the desired position is to be thought of as the highest quality product in the market, the product should be differentiated by actually delivering that exceptional quality competing products do not offer. Learn more about Differentiation and Positioning. Only if all of these elements build up on each other, the marketing strategy is strong enough to create and deliver superior customer value in order to capture value in return.